Teachers of Delhi University gathered at Parliament Street today under the banner of DUTA to protest against what they called ‘the complete apathy of the MHRD towards the issues concerning teachers not only of DU but affecting universities across the country’. “Teachers are particularly exercised over the failure of the MHRD to implement revised allowances and pensions, consequent to the VII Pay Revision, and disbursal of the required funds for its implementation,” DUTA president Rajib Ray said in a statement. The Delhi University Teachers Association or DUTA has also said that thousands of teachers and employees have been denied pension altogether because the MHRD (Ministry of Human Resource Development) has failed to release funds for those in option and third category and embroiled the rest in an endless legal battle through an SLP filed at its insistence. “The appointment process is at a halt and the regularisation of thousands of ad-hoc teachers is dependent on the withdrawal of the 5 March 2018 UGC letter asking for implementation of department/subject wise reservation roster and the subsequent freeze on appointments,” said the DUTA. 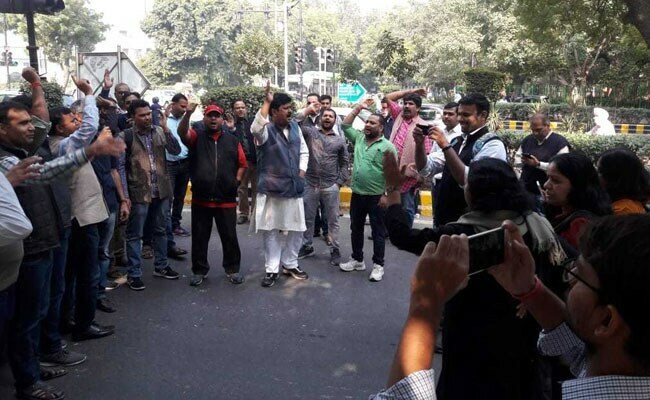 The teachers, in their protest, demanded the Government to initiate immediate steps to promulgate an Ordinance in the upcoming session of Parliament so that the appointments can begin immediately. The teachers also called the Tripartite MoU, replacing grants by loans through HEFA, Graded Autonomy and Categorisation of Universities as ‘relentless policy attacks on higher education that will fundamentally change the character, content and reach of public-funded education in the country’.